Although I grew up in Michigan, I can’t remember ever setting foot in Grosse Pointe. I guess it was just too far outside the bubble of Farmington Hills/West Bloomfield. Fortunately, my buddy decided to marry a Grosse Point native, giving me my first chance to see what food was like on the other side of Detroit. We headed to the nice little downtown area of Grosse Point and got ourselves a table at the Village Grille. I started off with a huge mug of Labatt Blue and took a gander at the menu. As I was perusing all the delicious-looking options, the waitress brought out a huge platter that looked pizza on top of nachos. 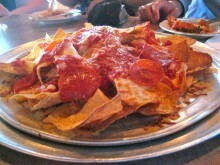 Pizza Nachos! Someone had ordered them for the whole table, and I was happy to eat the things. Putting pizza ingredients on tortilla chips is such a genius concept, I’m amazed I haven’t seen them elsewhere. After downing this delicious blend of Mexican and Italian cultures, I was ready to order something a little smaller than what I had been eying earlier. Just look at that bacon. Look at it! All of the food I saw was priced quite reasonably, so I knew that even if I ordered more than I could eat, I wouldn’t feel slighted. 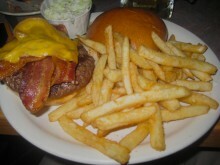 I chose the Bacon Cheese Burger ($5.25) and a side of fries ($1.50). The menu didn’t make any mention of having any other toppings on the burger, so I hoped it would simply be bacon, cheese and burger. Of course, this was not meant to be. When my burger came, it was open faced and I saw no trace of vegetables except the cole slaw exiled to a tiny cup. But when I lifted up the top half of the bun, I found some frightening veggies hiding below. There were pickles, lettuce and tomatoes, but since they were hanging out below the bun, they did not taint my experience. I freed the bun from its veggie captors and brought it over to the good, meaty side. The burger was really quite delicious. The cheese was basic American, but it really worked on this burger. The beef itself could have been a bit juicier, but the real centerpiece of the burger was the bacon. It was thick, crispy, smoky, salty and pretty much melted in my mouth. About 3/4 of the way through the burger, I was stuffed, but the bacon was so good that I at least finished that part. The fries were pretty good and worked well with the burger, but were pretty unnecessary after the pizza nachos. The Village Grille was a great little bar/grill and I left quite content. And come on, pizza nachos! Genius!